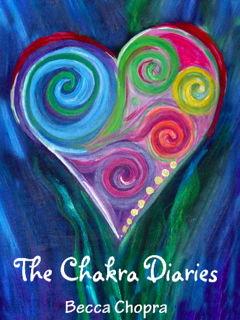 Thanks to Lisa Erickson for her review of The Chakra Diaries. In upcoming Becca’s Blogs, I intend to feature other reviews of metaphysical fiction and non-fiction that you may want to add to your bookshelf or Kindle Reader. The Chakra Diaries offers a fun, unique way to learn how the energy of the chakras manifests in our everyday lives, how imbalances may impact us, and how clearing and healing them can help us change ourselves and our situation. It’s a collection of excerpts from the fictional diary entries of several participants in a 12-week chakra workshop. They are asked by the instructor, Rebecca (who also has a chapter) to journal an overview of their lives up to this point, and then to document the changes in their lives that occur throughout the course of the workshop. Each chapter is a different character’s diary, so of course all are told in the first person. The chapters are organized by chakra, from the root chakra up to the crown, featuring someone whose greatest block or imbalance lies in that particular chakra. The character’s lives begin to intertwine as they get to know each other, and they feature in each other’s entries. Some of the stories are quite dramatic, with pasts ranging from sexual abuse to being orphaned, while others are more low-key – dysfunctional families, unfulfilling careers, financial issues, or relationship woes. These themes are traced to corresponding blocks or imbalances in their chakras, and they begin to experience shifts as they both work through these issues in their lives, and do meditation and energy healing work on the chakras directly. Someone new to the chakras will probably want to combine reading this with a non-fiction option, and/or with guided meditation CDs or audio files. Someone who already knows a bit about the chakras will appreciate this as way of exploring the ways chakra imbalances and blocks impact our actual lives. Some of the stories are very touching, and they are certainly never boring, so this is also a much more engaging way to explore the chakras than most non-fiction options. The Chakra Diaries are available at www.Amazon.com and www.thechakras.org.